That is our track! We've traveled for 66 days and 512 nautical miles, and reached our northernmost point of Telegraph Harbour, but the adventure continues. The seeds of the flotilla have been planted and left to gestate in a few individuals in our wake. Currently we are in Montague Harbour Provincial Marine Park on Galiano Island, waiting out some rainy weather and catching up on stuff. After Reid Harbor, Stuart Island, we had some business to take care of including securing unlimited data from Sprint while in Canada, (crucial to keeping our costs down and staying connected) and reducing our substantial liquor stores (silly us, stocking up on fruits and liquor on our way into Canada--Doh!) so we cruised back to San Juan Island for a full-service-yachtie-style stay in Roche Harbor. After a night on the hook, we indulged in a night at the marina, where there are cute young line handlers to catch your boat, 15, 30 or 50 amp power, delicious water, garbage bins at your slip, laundry, showers, ice cream, and even a post office on the dock! Once again we were just another midsized sailboat in big mess of fancy motor yachts... though in our hearts we're still Scotty's Great Dane! 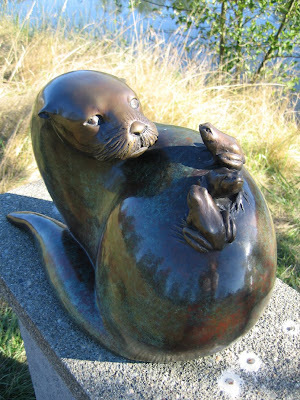 The best part of Roche Harbor was the marvelous sculpture park just a short walk from the marina. 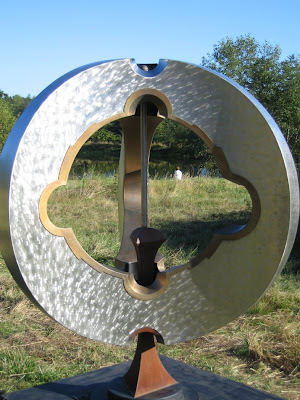 Westcott Bay Sculpture Park boasts 115 pieces scattered over 19 acres of ponds, woods and meadows. The pieces range from conceptual to representational, from interactive to abstract, functional to found, and materials include marble, steel, bronze, granite, aluminum, glass, redwood, fabric... you name it, there is something for everyone. Many were truly breathtaking. And best of all, like the Treasure Chest on Stuart where we purchased T-shirts and post cards, the Sculpture Park is on the honor system. You pay $5 at a self serve gate. They have a gate counter, and I suspect they've found that most people pay, and those who don't are welcome anyway. Art should be available to everyone whether or not they have money and whether or not they value it enough to give up a few dollars. I love the honor system! I think if you give people the choice to do the right thing, they will if they are able. Or at least I like to believe people are honorable. Naive? Optimistic? A sucker? Maybe. I guess I'd rather be naive than cynical and pessimistic. After Roche, we passed customs in Bedwell Harbour, but found Poet's Cove Marina a bit too chic (we'd had our fill at Roche) so we motored around to Port Browning for a night. Then it was on to the highly recommended town of Ganges on Salt Spring Island. We hit the famed Saturday Farmer's Market, watched a wonderful street performer from Ghana, and kayaked about. We started to land our kayaks on Goat Island to have a wee pee and a poke around, when a Park Ranger-type person pulled up in an official-looking inflatable and informed us that they weren't "encouraging people to land on the island." This has been our only brush with Canadian law enforcement. Much like the honor system, their approach offered us the opportunity for right action, which we promptly took. We also met a delightful, creative couple in Ganges aboard the ferrocement ketch, English Rose. We all hit it off swimmingly and decided to buddy boat about a bit. We aimed our collective 54 tonnes out of Ganges Harbour and circled Portland Island without finding safe anchorage to accommodate both our vessels. Ultimately we ended up in Genoa Bay where we had a raft up, dinner, and fun on the spacious and comfortable English Rose. 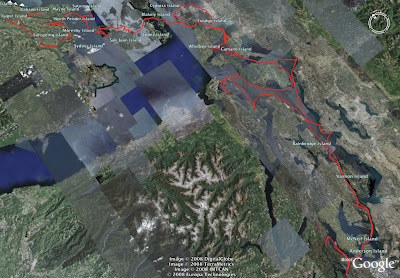 From there we continued north to Telegraph Harbour which separates Thetis and Kuper Islands. The marina, which is supremely down-home and laid back was only slightly unprofessional. Larry and Nancy of Jacari Maru (whom we met in Cornet Bay a few weeks back) saved a slip for us. We spent the evening tale swapping and Irish Whiskey sipping. We also met some young upstart technomads, Adam and Brittany on their 26' Coronado sailboat. Adam gave us a tip about shopping that's not in the guidebooks. He sent us to the tail end of the harbour near the boat ramp, up and across the street to a fruit and vegetable stand with fresh eggs, jams, honey, baked goods, and dairy products. The entire stand was on the honor system! Completely unattended. There were pictures and news clippings about the family that owns it and provides the goods. I loved this. We stocked up and saved ourselves a ferry ride to Chamainus where we had planned to get groceried up. Later that evening we kayaked through what they call "The Cut" a narrow shoaling channel between the Thetis and Kuper that connect Telegraph Harbour to Clam Bay. The current dumped us out into the Bay where we paddled along Kuper's shore. It appeared mysteriously uninhabited, and though quite beautiful, somewhat dark. I felt an unsettled vibe. 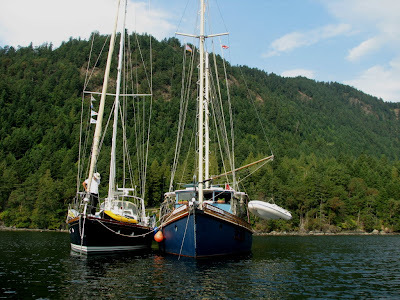 Once back to our net connection, courtesy of the Thetis Marina, I did a touch of research and found that the island has a history of over a hundred years of cultural abuse to native children. Salish children from all over the region were taken from their families and deposited in the Kuper Island Indian Residential School run by the Roman Catholic church. The claimed purpose of the "school" was to teach English and assimilate them into European culture. In essence they sought to destroy the language and culture of the people. This "school" evidently taught very little; as in other similar residential schools abuse and neglect were common. Like much of the European impact on the First Peoples, the history of Kuper Island was ugly and included the destruction of villages and the usual relocation of the people against their will. We have a vision of regaining control over our own destinies, allowing for strong, healthy communities for generations to come. Achieving this vision of reconciliation and a just resolution of our aboriginal title and rights within our territory will benefit the Hul'qumi'num people and indeed all Canadians. We stand firmly united in our conviction to negotiate a fair and honourable treaty — one that will enable our Hul'qumi'num communities to restore our historical prosperity and to ensure that our distinctive culture will flourish into the future. And while it delights me to see so many instances of the honor system at work in these islands, it angers me to think about how dishonorable our ancestors have been with natives they encountered here. I never cease to be amazed at the grace resilience, and goodwill of native peoples I encounter. I, for one, relish the small opportunities to be honorable. In return I wish to offer others this opportunity. Perhaps honoring and being honorable are key steps in the revolution of the heart that will begin to heal generations of wounds and the residual guilt associated with these dishonorable actions. We all know what is honorable and what is not. Those of us from fear dominated and untrusting cultures must make the effort to relearn to trust, and when given the chance, to practice what the Buddhists call "right action." Midnight Oil said it well in the song, Beds Are Burning. Excellent, informative post as always! And, as always, good to read of your travels and rendezvous with fellow sailors and gypsies! p.s. : Love the sculpture park photos! Awesome post, I hadn't realized that you've covered such a distance! Glad we could be at your northern most stop! Look forward to the floatilla!